One thing that pops up a bit in the “Yes, we’re special” crowd is “I’m allergic to corn.” And by a bit, I mean like, quite a bit. I can’t tell you how sorry I feel for you corn- and gluten-free people. I mean, HELL. After all, I think of corn and I think of tacos. And I think you all know that I love to talk about tacos. Almost as much as I love to eat them. While I eat the heck out of corn tortillas, I hear SO MUCH about how you people cannot. This makes me sad, as I don’t know how I would be able to be gluten-free 4 life if I could not have corn. Mostly corn tortillas. And chips. And nachos. But knowing that so many people have grain issues, I’ve been meaning to try a coconut flour tortilla recipe since I’ve seen them all over the Pinterest, my friend’s blogs, in those Paleo books, and anywhere else I look. Turns out, OMG SO EASY. And so delicious! And you know what else? I could use these as crepes, as wraps, as any type of bread substitute because it’s hella’ delicious, hella’ easy, and YUM. Just an FYI – for the BBQ pork innards, I did this super easy thing by taking two pork chops and putting them in the slow cooker on medium with a bottle of gluten-free Stubb’s BBQ sauce for about 3 hours. It falls off the bone, is delicious, and goes fantastically with black beans and cheddar. God, I love tacos. So do this, and get your taco on once again. 1. Beat egg whites until fluffy. Whisk in coconut flour, coconut milk and baking powder. Mix well until smooth. Add more coconut milk if mixture seems thick. You want it to be thin enough that it pours out easily and spreads to the pan’s edges. 2. Heat coconut oil on medium heat in skillet (about 2 teaspoons per tortilla). Pour enough batter in that swirls around to the edge. Cook for about 2-3 minutes or until the edges come up easily with a spatula. 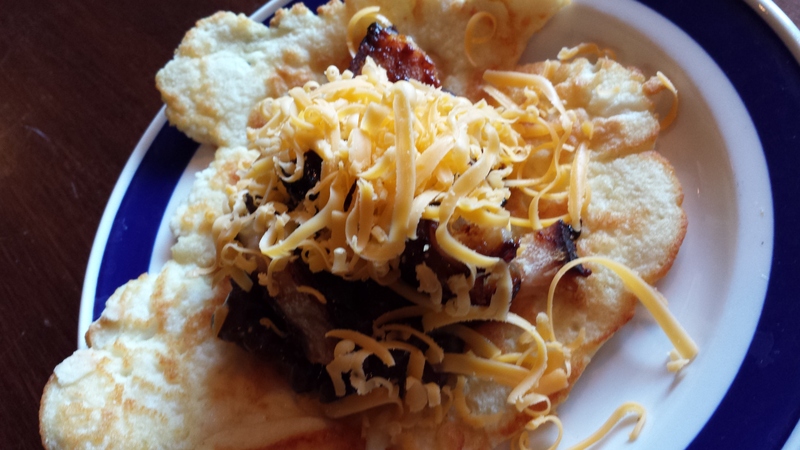 Flip tortilla and cook 1-2 minutes longer until brown. 3. Serve with toppings of your choice. Tags: corn allergy, gluten-free tacos, gluten-free tortillas, grain-free tortillas, tacos, what's your damage. Bookmark the permalink. Previous post ← A Very Whole Foods Holiday + Giveaway! I am one of those that is super-sensitive to both gluten and corn. (Thank goodness I’m ok with rice!) It is definitely a PAIN in the bread and candy departments. (Finding candy that’s made without corn syrup is hard. And WTF is WHEAT FLOUR doing in licorice???) Anyway, I love this recipe and look forward to trying it! You guys! I feel for you. But thank Yeezus for the Paleo recipes, amiright? Thanks for raising awareness to the corn and gluten free folk! It is a rough life lol but recipes like this really help! Interesting that it uses egg whites only. I will almost never use an egg-separating recipe unless I have a go-to for the egg remnants, so that will require thought. Also, what size of skillet did you use? I used a medium sized skillet, 9 inch! Ooh! I had a thought – using egg whites in a carton would solve the separating issue. Ta-da! I’ll let you know how it all turns out once I’ve tried it. I’m allergic to gluten, corn AND EGGS. Though I seem to sometimes tolerate the soy-free ones. I just put the pulled pork and black beans on rice with a little salsa and quac. Love your blog!